Legendary science fiction author Fowler Faulkes may be dead, but his creation, the iconic Dr. Derringer, lives on in popular culture. Or, at least, the character would live on if not for Faulkes’s predatory and greedy heir Hilary, who, during his time as the inflexible guardian of the estate, has created countless enemies in the relatively small community of writers of the genre. So when he is stabbed nearly to death in a room with only one door, which nobody was seen entering or exiting, Foulkes suspects a writer. Fearing that the assailant will return, he asks for police protection, and when more potentially-fatal encounters follow, it becomes clear to Detective Terry Marshall and his assistant, the inquisitive nun, Sister Ursula, that death awaits Mr. Foulkes around every corner. Now, they’ll have to work overtime to thwart the would-be murderer—a task that requires a deep dive into the strange, idiosyncratic world of science fiction in its early days. 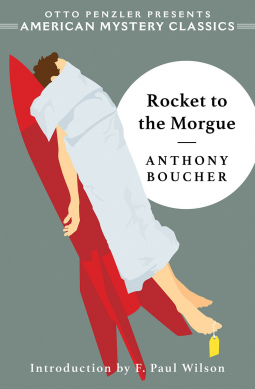 With characters based heavily on Anthony Boucher’s friends at the Manana Literary Society, including Robert Heinlein, L. Ron Hubbard, and Jack Parsons, Rocket to the Morgue is both a classic locked room mystery and an enduring portrait of a real-life writing community. Reprinted for the first time in over thirty years, the book is a must-read for fans of mysteries and science fiction alike. About the Author: Anthony Boucher (1911-1968) was an American author, editor, and critic, perhaps best known today as the namesake of the annual Bouchercon convention, an international meeting of mystery writers, fans, critics, and publishers. Born William Anthony Parker White, he wrote under various pseudonyms and published fiction in a number of genres outside of mystery, including fantasy and science fiction.